You might not know Kerrie Stanley, but you'll certainly know of her work. Every year, without fail, Kerrie's incredible sculptural millinery adorns the heads of many a fashionable filly come racing time. A former hair &amp; makeup artist, Kerrie now works full time on her eponymous label, along with acting as MC at various events, parties and launches. If that wasn't enough, Kerrie has also launched Designer Hat Hire, an online business offering fabulous hats, fascinators and other headwear from various milliners for hire – a genius and timely idea, considering the Carnival is now upon us! 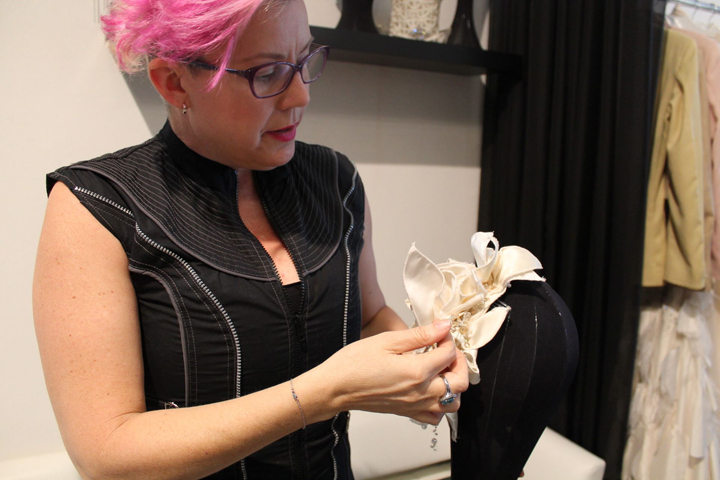 We visited Kerrie at her studio and got to know more about how she got her start in the business and her design process, as well as some of her most memorable projects. Thank you Kerrie for having us! 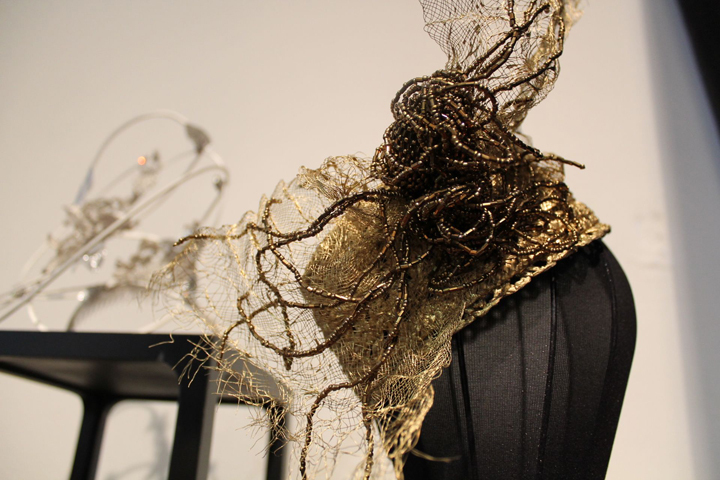 TUL: The wonderful world of millinery – tell us, how did you get into the field? My background is actually in hair & makeup. I was a hairdresser back in my Brisbane days and I used to work for Benni Tognini (an internationally known stylist and hairdresser) who used to make these amazing headpieces. As his apprentice, it felt like a natural progression for me when I moved to Melbourne. I was working with Rhonda Burchmore, doing her hair & makeup, and she asked me to make something for her for the Spring Racing Carnival. My first thought was "Ahhhh….sure!" and I did what I do best and just went with my gut instinct. I used a lot of fresh flowers, as no one was really doing that at the time, and made this beautiful vine. It's funny because now I don't work with flowers at all. I got to go to the Melbourne Cup with Rhonda and thought "this is pretty awesome" and it just went from there. TUL: You were saying you don't really work with flowers anymore; what would you say is your aesthetic? My aesthetic is something I love and something that I know I do best – sculptural yet simple, with a free hand feel, and always working with interesting materials. It's about taking materials that wouldn't normally be associated with millinery and working it into a way that is wearable and commercial. TUL: Are there particular materials you like to work with? Previously I've worked with perspex which was challenging, let's say. It left a massive mark on my head but it doesn't matter, because it looked good! There's this new material called thermoplastic – I'm not the only one using it but the way I'm tending to work with it is a little different. It's really opening up the scope to do free hand work as thermoplastic is heat-set so you can mould it before it cools. I love to play with gravity so I mount the material on the head and think, "Right, how's it going to stay there?" So then I play with it until I come to the final design and let it set. That said, whatever materials I use, I still like to keep it really simple. I don't like to over-embellish; it's all about the lines and the simplicity. The singular piece should speak for itself. TUL: Talk us through the process of putting something together – do you start with a particular idea and go from there, or do people come to you and say "I want this"? There are two different processes – if I'm doing it for my own creative satisfaction, or my own show or launch then I'll start with a concept. I can't draw – I'm not really good at that – so I always have an initial idea or concept in my head. I also have an idea of what I want at the end but with the design process in the middle, there tends to be a lot of workshopping of the types of components I use. When I'm working with a client, it's slightly different. I do have a disclaimer about how I work because when you come to me, you have to have a lot of trust in what I do – I can't say "This is exactly how it's going to turn out" – unless it's a plain, simple design, but honestly, my clients don't come to me for that, they come to me for my free work. We'll have a discussion about colours and materials, and during this meeting, I'll get an idea of the client's personality. Essentially, that's what the piece is, an extension of the client's personality. From there I'll go with my instincts – I know something's working when I get that ZING feeling. TUL: Have there been any favourite or memorable projects? Definitely last year when I made a hat for Boy George – I'm an 80s girl and I love Culture Club, so it was a dream come true. Boy George was in the country for some DJ gigs and after seeing him on 'The Project' my daughter told me he needed one of my hats. He happened to be DJing at my friend's club, so I rang him and said "I'm coming tonight….with a hatbox in tow". I made this hat that was inspired by Boy George's signature fedoras and he ended up tweeting a photo of it! He loved it and it made my year. When I saw it, I was absolutely beside myself. A close-up of one of Kerrie's masterful designs. TUL: So, the Spring Racing Carnival in Melbourne – is that something you're working on all year or does it kick off at a certain point? Ideally, I should be working on it all year but, you know, life and other priorities get in the way. I always find though that certain components I've worked on in previous years come back in following years – for example, last Spring Racing Carnival there were a few things that for, one reason or another, didn't come to fruition but then they've popped up again and I've been able to further explore them. So then yeah, you could say then that there's always something ticking 12 months of the year. I do stock in Myer though, so it really gets underway in March/April when I have to start designing the collection that I present to them in June. Myer then place their orders, with the millinery needing to be delivered by end August/beginning September. TUL: Speaking of Myer, do you aim for that collection to be different to your existing work, or is it quite similar? Over the years, I've learnt that for the Myer client, it has to be a comparable piece size-wise to what they're spending. Some years ago, I did this really nice leather collection thinking that women could wear them all year round and not just for racing. However, it bombed because although they were incredibly beautiful, the pieces were quite small and pricey. The consumer couldn't see the value, so now I make things that are perceived to have more substance. So yes, the pieces I make for Myer are just for them – they're great in giving me free reign over what I prepare for them. TUL: Has there been a particular celebrity, or public figure, that has worn one of your pieces that you've received a lot of attention from? From a commercial point of view, it was Melbourne Cup 2008 when I did a piece for Jennifer Hawkins. It was a collaboration that I did with Paspaley Pearls – they gave me $120,000 worth of pearls and diamonds to work with!!! Jen was wearing this beautiful silk Nicola Finetti dress so I used all these silk components along with all the pearls and diamonds to make this gorgeous, encrusted floral piece. That was also the year that Snoop Dogg came out for the Cup, so there's this great photo of the two of them together. The piece ended up getting so much attention and it eventually transpired into me working with brides. Jen's piece was very much my take on a floral and I had women emailing me from everywhere saying "I want that for my wedding!". Before that I had done a little bit of bridal work, mostly through the couturiers that I work with – Mathieu Salem and Craig Braybrook among others – but not a whole lot. The Paspaley piece changed that! Jennifer Hawkins wearing the famous Kerrie Stanley x Paspaley creation (above) at the 2008 Melbourne Cup and Kerrie with a replica of the piece in her studio (below). TUL: What are your tips for the Spring Racing Carnival? Anything that you think will be big, or things that you think women should consider when it comes to headwear? 1) First and foremost, always dress for your personality. If you're not comfortable in something, it'll show and you'll end up looking awkward. 2) Dress for comfort – it's a big day and a heavier hat or fascinator might give you a headache by day's end. Remember to ALWAYS keep your headpiece ON YOUR HEAD – just like you should ALWAYS keep your shoes ON YOUR FEET. 3) Sometimes it's easier to start with your outfit and then find your millinery to go with it, unless you want to wear a statement headpiece. In that case, go for something a little bit more simplistic with your outfit. 4) Don't think that going to a milliner has to be an expensive exercise and something that is out of reach – it's really not. It's actually quite a beautiful process where something is made specifically for you. TUL: Finally, you've collaborated with artist John Knap whereby he's created a series of paintings that you've then used as inspiration for a series of headpieces. How did that come about? I've known John for a long time, since we were both 18 and living in Townsville – he was a first year art student and I was a first year hairdresser. We kept in contact over the years and after bumping into each other in Melbourne, we decided to work together – I had always wanted to collaborate with an artist and he was the perfect fit. I loved his 'Geisha' series, I was really drawn to them, and then when I saw his 'Famous Faces' series, I thought "hmmm now you're talking!" I didn't want to do the predictable 'face-on-a-hat', it's been done, so I sat with John and chose 12 of his paintings to use as inspiration. I took the eyes from one painting and the lips from another and incorporated those features into my designs. They've got really kooky names like 'Eye Spy', 'Eye See You' and 'Loose Lips'. It's quite the mash-up and I'm really pleased with it. 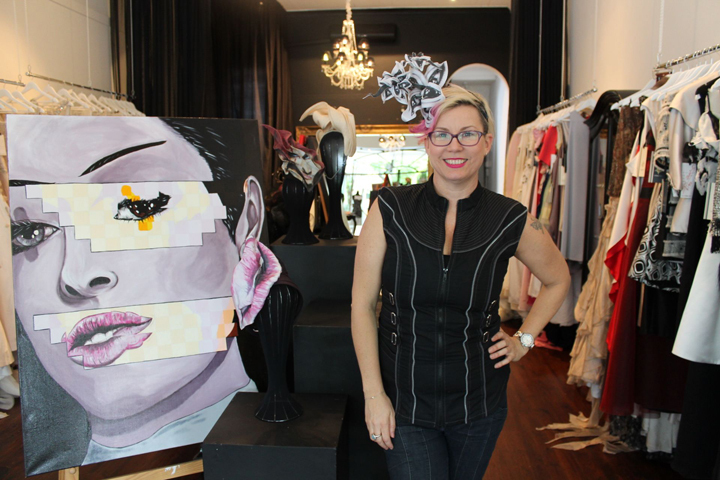 Kerrie posing alongside some of the creations from her collaboration with John Knap. All other images - Emma Forster, The Urban List.